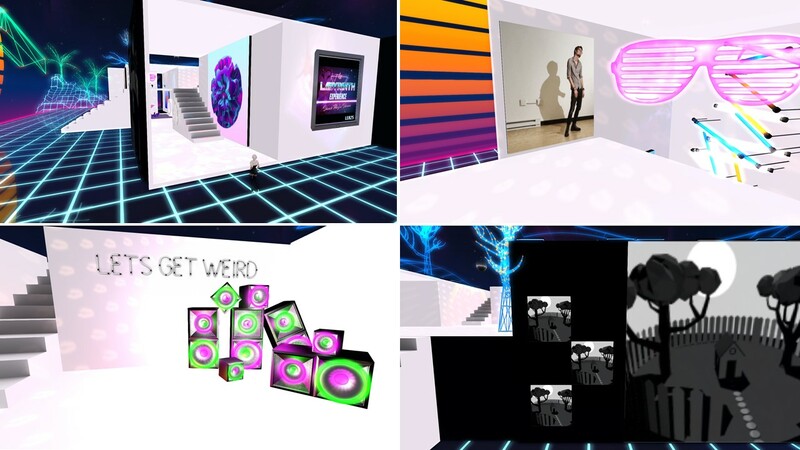 For my simploring tour on October 3rd I selected “The Labyrinth Experience“, an installation of Subversive Vavoom and Rhodan Kuhn at LEA 25. 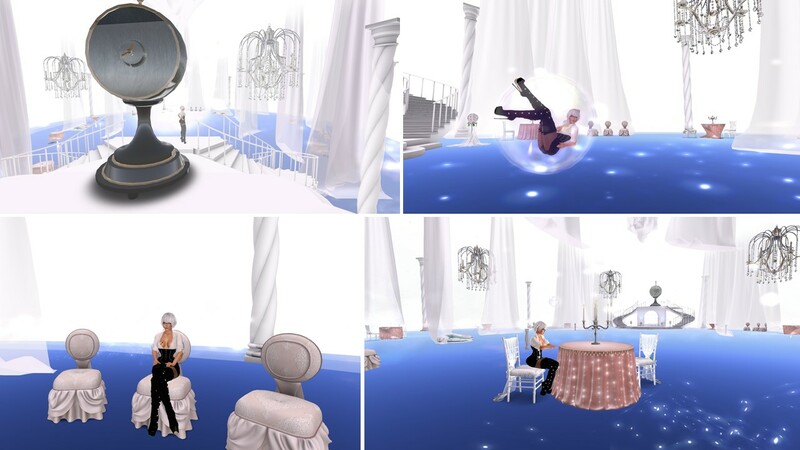 The Labyrinth Experience requires a Second Life Experience to animate you, teleport you, and attach items of use to your avatar temporarily while on this sim. It is an adventure and you have search and find clues in order to get out of the Labyrinth. But it is not just the inital labyrinth where you have to find your way out. 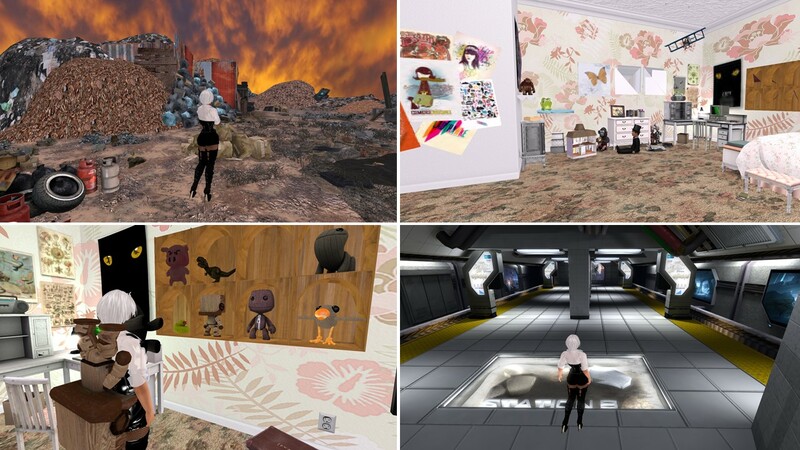 During your stay, you have to find objects that interact via left-clicking, and some that are required to find to advance to the next location/level! To start your adventure you need to click “Enter The Labyrinth” at the provided landmark to The Labyrinth Experience. 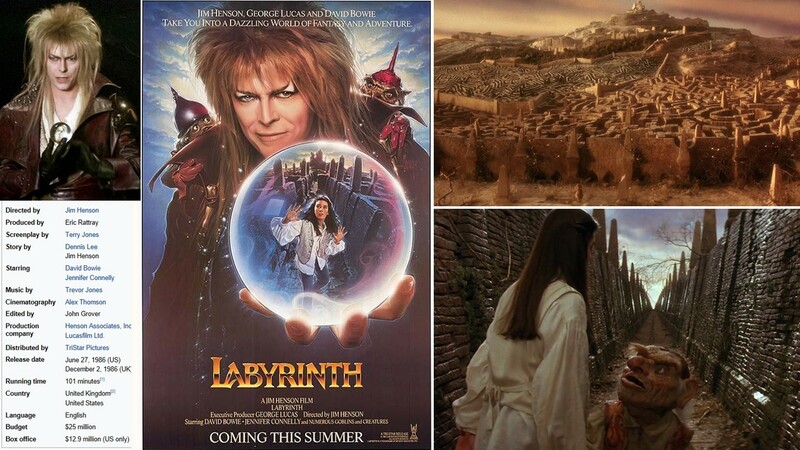 The Labyrinth Experience is based on the movie Labyrinth from 1986, with David Bowie and Jennifer Connelly, directed by Jim Henson. You can see a trailer of this movie here. I myself was not familiar with the movie and I watched the trailer and got some background information on wikipedia: “Labyrinth is a 1986 musical fantasy film directed by Jim Henson, executive-produced by George Lucas. The film revolves around 15-year-old Sarah’s (Jennifer Connelly) quest to reach the center of an enormous otherworldly maze to rescue her infant brother Toby, whom Sarah wished away to Jareth, the Goblin King (David Bowie). 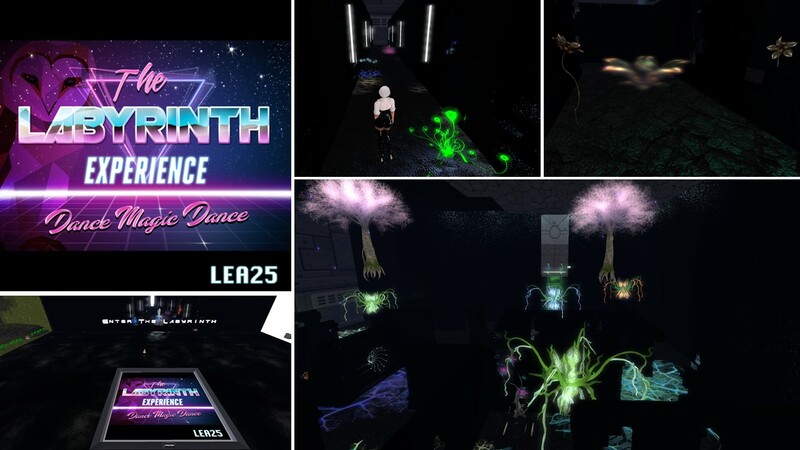 I entered The Labyrinth Experience and began my adventure in the inital labyrinth, which is quite colourful decorated with glowing plants and thus offers really nice views. Once I found the exit I had to talk with two guards at the exit door and select one of two doors. I don’t know if I took the right door. 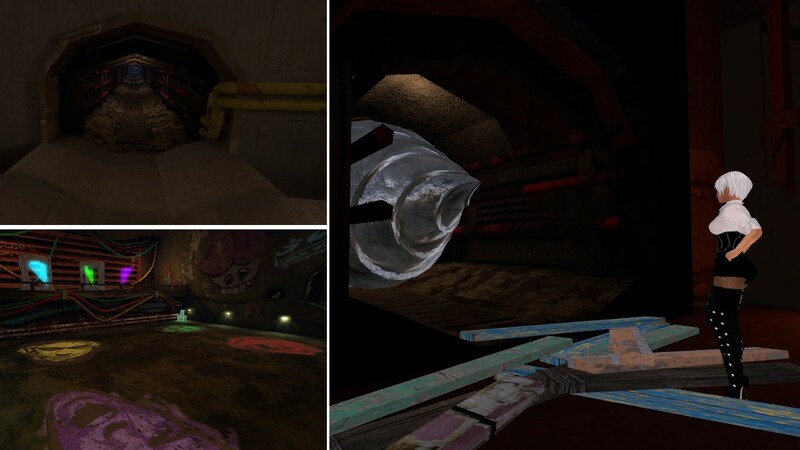 It took me to another maze and from there I came to a platform that looked like one of the early video games, for sure this platform is a reference to them. This platform wasn’t easy to leave, but somehow I made my way out ….. an fall into a tube filled with green slime and was transfered to the next level, a strange world, obviously contaminated. There were bald trees, green toxic fog, an old plant in the background, not a world you’d like to stay in for long. From there I came to a lovely ballroom, that I enjoyed exploring. First I was a bit unsure whether that’s the end of the adventure as I couldn’t find any way out, found no hint but also no sign “End”. I found my way out and landed in another environment that looked a bit like after a war. But there were toys that I collected by colliding and in the middle was a container with a fully equipped children´s room. Some of the toys there work when you click them. There’s also a shelf with cuddly toys and you can bring the toys you collected by colliding to the shelf and get the toy for your inventory. 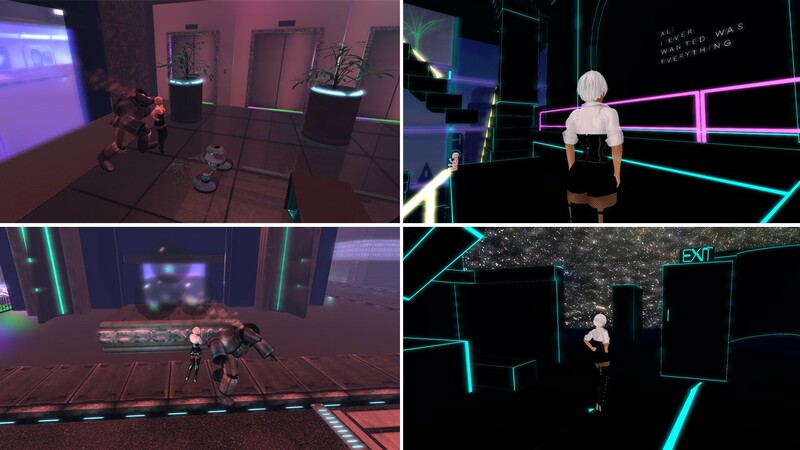 The next level brought me to a futuristic underground station and from there to a scifi city. I had to be brave not to run away from the robot guards in this town. I found Goblin Inc. and entered their offices…. and found my way to the last level which I had to explore in mouselook and which led to the exit door. The exit brought me to an exhibition with some really nice pieces of art, mostly animated. This exhibtion itself was worth the effort of the the adventure before. All levels of The Labyrinth Experience are artful and offer outstanding views and most probably a lot of details for those familiar with the film Labyrinth. I did not reveal how to get from one level to the other. You have to find out yourself. I had really fun with solving the riddles, with interacting and I enjoyed the views and took many pictures. Be sure not to miss The Labyrinth Experience. Many thanks to Subversive Vavoom and Rhodan Kuhn for creating The Labyrinth Experience.